One small problem lying in the background can easily question your business competence. Inefficiency may be destructive to your reputation, customer satisfaction, project management, and many more areas you’re responsible for. To become well-versed in the art of problem-solving, you need to arm yourself with two things. First, patience. Second, the most effective methods and techniques, which we’ve collected as a result of our investigations. It turns out that these two methods mentioned by Orloske are well-known among business professionals and are widely used in the healthcare industry, as proven by Deepa Kalangi, a project manager at CVS Health. These methods will get you closer to the root of the problem, helping you define its scope and set a plan. But problems and scopes differ, so there are myriad techniques to address them. You need to distinguish between a process that involves problem-solving, a process for problem-solving and tools for use within a problem-solving process. 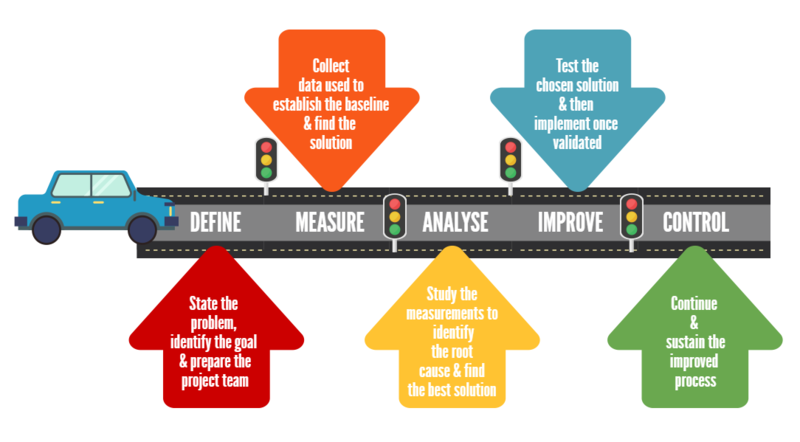 For example, Six Sigma is a process that involves problem-solving as a step, Root Cause Analysis (RCA) is a process for solving problems and brainstorming is a tool that can be used within Six Sigma or RCA when idea generation is needed. In this article, you’ll find commonly used methods, tools and tips based on specific problematic occasions. At this point, let’s just admit that every issue is unique and we should approach each with methodological precision. Companies using Six Sigma, such as World Vision USA, encourage others to apply this method as it has helped them increase profitability and reduce costs. The key advantage of Six Sigma is that it prevents rather than fixes defects. Six Sigma has some disadvantages that will make you think twice before opting for this method, however. It’s customer-oriented and will likely cultivate resistance to change. Epicflow’s team can’t agree enough with the opinion that the Six Sigma method gets your business to an extreme that stifles creativity. When applying Six Sigma, you’ll have to remember that even if it can help you reach the heights of planning perfection and customer satisfaction, it will always doubt and criticize innovation. Since innovative products have a tendency to carry risk, they may be rejected in favor of solutions that are non-defective and flawless. But what are our options in favor of innovation? Every problem has two or more solutions. The most common tools for finding solutions are found in lean: A3, Kaizen, 5W, Value Stream Analysis, PDCA, Ishikawa Diagram. It’s important that problem-solving is a routine process in your business and not just a one-off event. Getting started with daily problem-solving is a challenge and takes persistence, but the results over time can be spectacular. Apart from delivering bottom line benefits, an effective problem-solving process goes hand in hand with an effective lean system. Let’s take a closer look at lean methods and their problem-solving potential. A3 problem-solving is close to the plan-do-check-act (PDCA) model and anticipates that you divide your approach into eight steps: describing the problem, mapping out the structure, setting targets, planning containment, looking at causes and effects, following up, confirming results, and sharing actions. A3 was first used by Toyota. 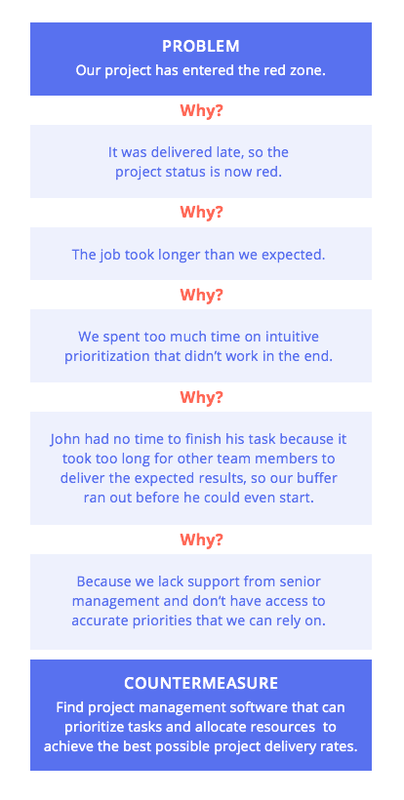 As you can see in the above example, the 5 Whys get to the root of a problem through communicative brainstorming and lead you to possible solutions at once. This method is pretty fast, but there’s no guarantee you won’t overlook small but important details. To analyze a problem more thoroughly, the Epicflow team encourages you to use Kaizen. As a result, every employee has a chance to express self-corrective and focused criticism to improve the work process. This mechanism is beneficial because it instills transparency and makes employees realize that the company is on its way to continuous improvement. An Ishikawa diagram is a fishbone diagram for evaluating factors that contribute to a certain defect. The defect is shown in the form of a fish head, while the bones represent causes of the problem, with smaller bones representing minor extended causes. This diagram was reportedly used by Mazda Motors to develop the Miata (MX5) sports car. We recommend an Ishikawa diagram when you have to analyze a problem that has many levels consisting of major and root causes. The history of problem-solving methods is built not only upon the experience of successful companies. It’s also built on observations of battlefields and flotillas, on weapon design and other military spheres where one mistake could ruin the whole strategy. The rise of the military-industrial complex was one of the turning points in developing methods that giant corporations now use to streamline their business operations. You’ve probably heard about this problem-solving method from famous international corporations. In its classic form, TRIZ was developed by science fiction writer Genrich Altshuller and his associates when inspecting inventions in the department of the Caspian Sea Flotilla starting in 1946. Giant corporations including Samsung, Rolls-Royce, BAE Systems, and General Electric have documented their loyalty to this method, stating that it drives them to an ideal state of innovation. We spoke with Łukasz Paluszkiewicz, a project manager at BD, a global medical technology company, about how TRIZ gives you a competitive advantage. This is a complete methodology for solving problems. It all started with technical problems, but now it’s widely used not only in technical areas. Even knowing the basics of TRIZ helps you think in a different way. You can switch from natural thinking to TRIZ structurized thinking. You can be more reasonable in your solutions. You can find out more about the TRIZ philosophy and tools in The Triz Journal. Gabe Torres, a Tactical Operations Planner coordinating assets to support maneuver units in the United States Air Force, advises us to consider the OODA loop as a helping hand in problem-solving. OODA is an acronym for Observe, Orient, Decide, Act. The OODA loop was advanced by Colonel John Boyd, responsible for strategy development in the US Air Force. Even though Boyd’s method was designed to be applied in military operations, you can use it to understand commercial operations and learning processes or when dealing with any kind of opponent. The Delphi method is a forecasting method based on the principle that groups make better decisions than individuals. It consists of several rounds of questions regarding a particular problem, during which experts can change their opinions in favor of opinions they hear in favor of others’ opinions. The Delphi method dates back to the Cold War and was used to predict the influence of technology on warfare. It helped me a lot in stakeholder and especially PMO meetings. For example, I had an analyst and PM with very strong personalities who became confrontational and unprofessional during vendor and project meetings. I implemented the SBAR during a lessons learned meeting, providing tools to be mindful of others’ opinions during time-sensitive situations. Leadership approved it and SBAR improved communication, decreased negative bias opinions and led to quicker project resolutions so we could stay focused on project tasks. The simple truth is that bottlenecks can be predicted, and there’s a set of methods to fulfil this mission. Parthasarathy Rajendran, former Senior Business Analyst at Oracle Corporation, shared his experience with Force-Field Analysis, a method that helps you identify influencing factors for maintaining change and innovation and problem-solving related to competition. If you work in a manufacturing industry, you can opt for Failure Mode Effects Analysis (FMEA), a good method for predicting failures in a design or assembly process in two successive stages: identifying potential failures and determining their consequences. FMEA thus consists of steps to reduce failures to a minimum, based on priorities. You can find more problem-solving methods for specific purposes. We’ve highlighted tools that are frequently used in real time and are efficient for handling many challenges. The best way to approach problems, however, is to predict them and elaborate your own prevention tactics. Epicflow is a project management tool that helps you solve three problems on the workfloor – planning overhead, overload, and prioritization. Let us know when you’re available for a demonstration and our experts will show you how Epicflow combats these three issues.